Looking to pass your RHCE exam? Look no further! 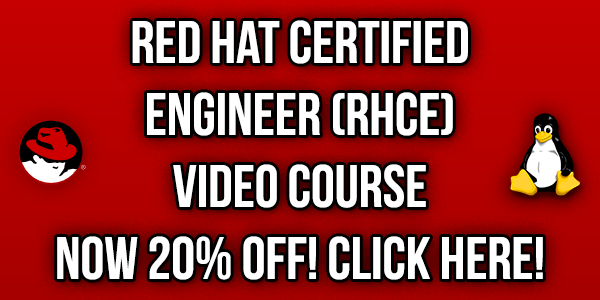 I’ve created an RHCE video course and published it on Udemy. 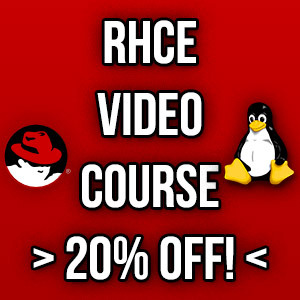 This course will prepare you for the Red Hat Certified Engineer (RHCE) exam (EX300) by expanding your Linux skills with clear explanations and easy to follow examples. The lessons will walk you through each exam objective and show you practical examples in Linux that you can follow along with in your own lab environment. We first begin by showing you how to set up the lab environment, and then jump straight into the practical examples. Each lesson will conclude with a list of important things that you need to remember for the exam, including specific commands and locations to inbuilt documentation that may be referred to during the exam. By the end of the course, you will know how to complete everything needed for the exam and be prepared to succeed! The course is normally $50, however for readers of my website you can pick it up for 20% off by using the coupon ‘ROOTUSERS’, or by simply clicking on any of the links on this page which should automatically apply the discount. The rest of this page is a directory that links to posts I have done that cover the official objectives in the Red Hat Certified Engineer (RHCE) 7 exam. Basically if you need to know detailed information on any of the objectives below simply click the link for further information. I created these posts while studying for the RHCE EX300 exam myself, I passed it with a score of 281/300. The official objectives for the RHCE 7 exam can be found here and are covered below. The RHCE assumes that you are familiar with all content in the RHCSA, you can view the RHCSA exam objectives here. My RHCSA study guide covers how I studied to pass this exam with full marks. Below you will find links to posts I have created covering different areas of the RHCE exam which will help you study for the exam. Install the packages needed to provide the service – This objective has been covered throughout all of the linked posts on this page, as along the way we have included how to install the required packages. Configure SELinux to support the service – This objective has been covered throughout all of the linked posts on this page, as along the way we have included how to configure SELinux for the particular service. Configure host-based and user-based security for the service – This objective has been covered throughout all of the linked posts on this page, as along the way we have included how to secure services in this manner where applicable. While I have explained the RHCE exam objectives in each of the posts above, the video course will likely be easier to follow as it allows me to actually show you how to complete everything. Tomas from Lisenet.com has also created some great RHCE posts. CertDepot also cover different areas of the material. Red Hat, RHCSA, RHEL, Red Hat Certified Engineer and RHCE are trademarks or registered trademarks of Red Hat Inc. These videos, guides, and creator are not affiliated with the trademark owner. I’ve added a link to your blog on my page as a valuable RHCE resource. I’ve now added a link to yours as well as I found it pretty useful while I was going through my own study! I just realised that you haven’t passed the EX300 exam yet. Have you tried it, or are you still studying? I’m currently still studying for it, I have my exam booked in 2 weeks time! Not that much time left to study then :) I’ve got mine next week, so we’ll see if I can manage to pass it. Good luck! Your posts on the topics are good so I expect so! I passed with 281/300. It was an easy one TBH, took me approx 2 hours to complete. Thanks a lot Jarrod for putting blogs posts, they really helped me. Congrats! Nice work, what are you going to do next? I was going to take on OSCP as it’s really something I wanted to do for a long time. However advanced security is more of a hobby than something I deal with at work, therefore I’ll likely pursue RHCA. Oh that’s cool, I was thinking about OSCP too for the same reason! RHCA is probably a bit much for me, good luck! I really like your site and I’m using it for my own studies. How long did it take for you to prepare for the rhce exam? Thanks, glad you’ve found the information useful! I wrote these posts over the period of almost a year and took breaks in between, however I probably spent 1-2 months studying continually prior to actually taking the exam. excellent material, congrats for the hard work. Hi Jarrod, I’m interested in your RHCE Udemy course. I noticed some of the reviews have said that the course was fast, have you or do you plan to address this? Thanks in advance for your response. Hey, it is a little fast paced I suppose. I can’t really address it without redoing the entire video course, which I do not plan on currently doing. They are videos, so you can always slow them down, watch them again, and pause as needed to take something in. I believe Udemy also offer a 30 day refund, so if you do find out that it’s not for you then you can always go ahead with that too. I appreciate you responding my question. I have passed the RHCSA and you make a point about the lessons being videos. I will go ahead and purchase it and let you know how I do. Since you passed the RHCE can you tell me roughly what percentage of the questions are RHCSA related? It’s been two years since I passed the RHCSA version 7. Thanks Jarrod! Hey no problem. It’s hard to say, I mean nothing specific from the RHCSA is tested, you’re tested against the objectives listed in the RHCE, however knowing how to do RHCSA tasks is assumed and sometimes possibly needed in order to do a RHCE task, so based on that it’s difficult for me to attempt to come up with an approximate. No problem. Thanks for the input Jarrod. Just Wow,You share excellent information & it’s handy enough. Hello if the RHCSA 3 yrs ends can we exam for RHCE or do we have to recertify for RHCSA again? I’m honestly not sure on that one, sorry. To book your RHCE, you have to enter your RHCSA Cert ID to register the exam. It is possible that they use this ID to see if you are eligible to book the exam.